Need a reminder about your meeting on your chrome browser or want to add timer on your browser. Yes now you can do this easily with the help of new Google chrome addon called Omnibox Timer. 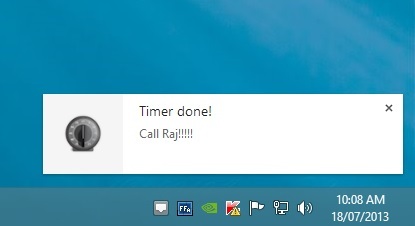 There are so many other ways to get reminders on your desktop, one we previously mentioned in our article Get Email Reminders by Sending an Email with Reminderbaba Now today we found a new way to set times on your chrome browser, with this way you can set a quick timer or reminder on your chrome browser about your meetings, call or any pother important work. If you spent most of your time in front of your PC then this one is one of the best addon to set timers on your Chrome browser and get alerts on the set time. Omnibox Timer Addon is free to download and you can instal it on your Google chrome browser form the Chrome Web store or you can find the download link at the end of this post. The addon works only with the Google chrome browser, so you need a Google chrome browser you can download the latest Google chrome browser from here. The addon is really easy to use and take 2 t0 3 minute to setup the addon with your Chrome browser. So lets take a look how the Omnibox Timer Addon works on on the chrome browser. First install the Addon from the Google Chrome web store, the addon is simple to use that you wouldn’t need to launch a program. Once the Omnibox Timer Addon is installed on your Google chrome browser, you are ready to add or set timer on your google chrome browser. To set the new timer open the new tab on your browser and type ‘tm’(without the quotations) on the address bar, now on the right side of the address bar you can see the new message “Pres Tab to Send commands to Omnibox Timer”. Now Hit the TAB button from your keybaord to enter the new command on the Chrome Address bar. Now all you have to enter the command on address bar to setup the timer. suppose if you want to add a timer to call some after 1 hr. then type 1h Call Raj. Now the timer will setup on your browser and you will get the alert form the addon after 1 hr. With the same way you can add timer for Seconds, Minutes and other time interval, here are some example 5s = 5 seconds, 5m = 5 minutes and 5h = 5 hours. One of the nice way to set quick reminder on your MAC or windows PC. Hope the developer will add some more feature on the next update like change sound notification, change the color of the popup window etc.